The Pikeville Medical Center (PMC) Heart and Vascular Institute is the heart of healthcare in the region and is leading the way to a healthier and longer life for patients in and around the community. On Thursday, January 17, the first transcatheter aortic valve replacement (TAVR) procedure was performed at PMC. TAVR is a minimally invasive surgical procedure for repairing a heart valve. It is an FDA-approved procedure for people who are considered an intermediate or high-risk patient for standard valve replacement surgery. A team of 14 highly trained physicians, nurses and cath lab technicians was part of this historic procedure. 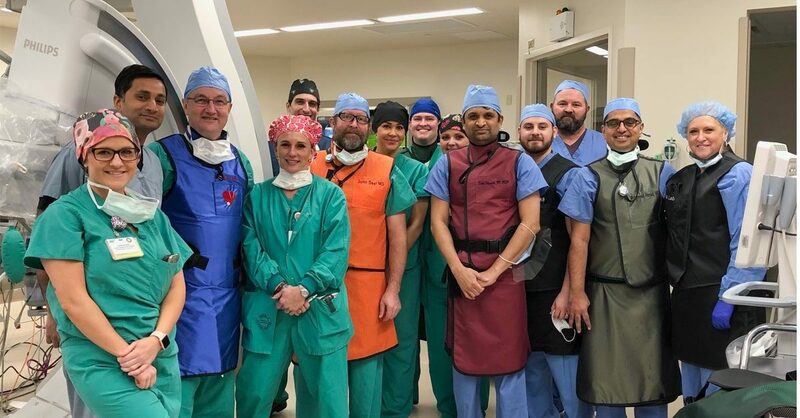 PMC Interventional Cardiologists Muhammad Ahmad, MD, and Deepak Pattanshetty, MD; Cardiothoracic Surgeons Dermot P. Halpin, MD, and John Deel, MD; Anesthesiologist Randy Legault, MD and Cath Lab Manager Johnny Webb, RT(R) led the procedure. “This is a huge step forward for PMC and the Heart and Vascular Institute. This advanced technology helps improve the quality of care we are able to provide patients of this region. We are now able to offer most all services for heart surgery,” said Dr. Deel. Heart disease is the number one killer of men and women in the United States, and in eastern Ky. PMC has the monumental task of treating this deadly disease. It has been said that “where you live” should not determine “if you live”. PMC’s commitment to treating and saving the lives of those with heart disease is evident through strategic investments in cardiac care. For additional information about advanced heart procedures at PMC call 606-218-2201 or visit our Heart and Vascular Institute page.